Camp Liberty in Iraq is the location of Iranian dissidents who were guaranteed protection by the USA and United Nations, in exchange for giving up all of their weapons. That protection has never been forthcoming and the residents have all but been abandoned to Iran’s puppet regime in Iraq. In the latest of many incidents, including delays in medical assistance causing death and armed massacres on the defenceless residents, Iraqi forces are depriving residents access to their own forklift trucks. This means they must carry heavy loads with their hands or on their backs. The enclosed photos show the residents moving supplies by hand or on their backs. The Camp Liberty residents were originally in Camp Ashraf, but they were tricked into moving by the United Nations’ Special Representative, Martin Kobler. Ban Ki Moon has ignored the pleadings of the residents and their supporters. 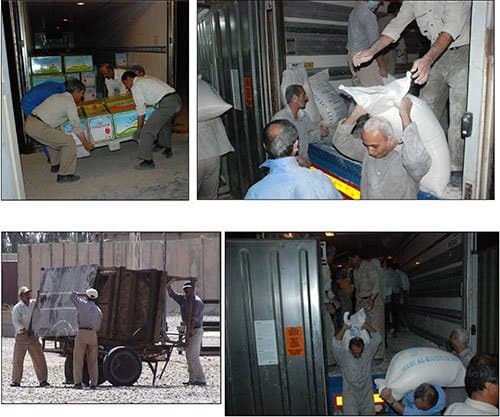 Iraqi forces prevented the transfer of dozens of forklift trucks owned by the residents, from Ashraf to Camp Liberty. After numerous referrals by the residents to the United States and the United Nations authorities, a trilateral arrangement was agreed in November 2012. That agreement, between UNAMI, the residents, and the Iraqi government, allowed two forklift trucks to be transferred from Ashraf to Camp Liberty. The Iraqi forces refused to hand over the two forklift trucks to the residents and it was decided that the forklift trucks be kept at the police battalion to be given to the residents on a daily basis and returned back at the end of the work. Iraqi intelligence agents have taken the forklift trucks to another location, for their own use. Obstructing residents from using their own forklift trucks as the simplest equipment to carry loads is an anti-human act by the Iraqis. Residents have no other option than to constantly carry heavy loads with their hands or on their backs, and over the past few months, this has caused severe backaches and hand aches, as well as osteo-diseases for many of the residents.